Trek to Debuchi, the trek started in the morning at 8am, after nice breakfast, the lodge owner gave us good luck scarf and greet us and siad good bye, we left in good mood, hundreds of people were hiking up through the trails, its interesting to see hundreds of people visiting this part of the world, its sad that Pakistan, Gilgit-Baltistan, K2 and Concordia ,Hunza,shimshal pass, and chitral provids great adventure trek,climb but unfortunately very few touruist there, they must know that those areas are pristine and must visit to see the natural beauty of the region!! Well, after one and half hour of hike, we reached at lunch place, the lunch took long than normal , however we continued for the dsitination. Weather is nice ,warm and we trekked in tshirts. The weather was nice,after break fast , we start our trek from phakdin toward Namche. Every one in the group was feeling great, today was supposed to be long day and uphill climbs,including passing through several bridges, after two hours of trek, we stopped for check point for entery, it was done and we continued, at lunch place we spend nearly two hours, the food was surved and we start for Namche, from here Mirza start fast and got to Nache one hour before the rest of the group. I did takek some shoots too, met the jordanians ,Mostefa who leading them, felt so good to see this much large Jordanian treking to EBC. When I reached Namche, didn’t know which hotel we going to stay, then called Mingma in Khatmandu he told me to go to Himalayan lodge, the guys there so nice and served with hot tea, later the team arrived iNcluding samina, Samina ,Tashi and Nugshi became good friends and enjoying the trek ,lots of laugh and fun.before Dinner, I hiked up to the airport above Namche Bazar. The view is just incredible. The lodges are nicely built and amazing colors. Nice Market. Within half hour I turned back to Hotel. Dinner was nice, and lots of fun. Mingma told us that the flight tickets have been puchased for us to Lukla for the morning at 5am, so we need to reach the airport early. We packed everything very late in the night and then woke up at 3am again to reach the airport in the dark, and luckily we were the first to get there. Board was around 6am, we had a safe landing on the short & famous landing strip in Lukla and it was nice, loved the plane ride, the weather was fantastic. After Breakfast in Lukla we started our hike, it was 2 hrs to the lunch place. 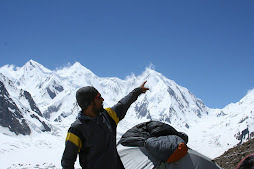 We continued the trak after a 2h rest, to reach Phakdin for the night. The trek was easy and nice. the lodge and food just amazing! It was pretty early at 3 am when we woke up and rushed for the airport, just to hear the announcement, that revealed that the flight is one hour delayed, we kept waiting at Quid E Azam airport Karachi, til 8am,when the announcent was made to porceed, the flight was nice. While boarding the plane, we met a nice lady from Finland and had nice conversations during our flight. PIA flights are usually interesting . We finally arrived in Khatmandu. Since we had visa in advance, there was no problem to stand in line. Outside Dawa and his staff were waiting for us, a warm welcome was made and the traditional scarfs were given to both of us, then we were brought to the hotel. It is pretty hot in Khatmandu! One interesting thing I foundwas, that the roads were broken and work was still underway. When I visit Khatmandu for the Manaslu Expedition last year, it was the same ;-) At the hotel we arrived around 1:30pm, after check in, Dawa told us there is Dinner for the entir group at 7pm, so we had some time and since we were sleepless for the last two days already, we took a nep first. After that we went to the nearest shop to purchase necessary thngs. And in the evening at 7am Tashi came to pick us up and drove us to the dinner place. Another good thing at our hotel is free wifi that we can use. When we came back from the dinner, we enjoyed some great Nepali traditional dance. I loved it thoroughly, we met Mingma the elder brother of Dawa, the first Nepali sherpa to complete all 14x8000er mountains in the world. We also met their other brothers, very lovely people and nice dinner and dance. The next highlight of the days was meeting our Indian team members, there are two twin sisters from India, going to climb Mt.Everst. Later we went to hotel at around 10pm. After the Press confrence at the Islamabad Press Club at 3pm, we rushed to the airport to catch the flight for Karachi, since there is no direct flight to Khatmandu. We managed to fly to Karachi after half hour delay. Arrival time in Karachi was around 11pm. Pakistan International Airlines (PIA) took us to their Hotel, the flight was nice excpet the delay. We had exess weight but thanks to PIA to let us go through with out extra payment. Very nice support from PIA!